NYC Ferry operated by Hornblower is excited to announce the launch of its Soundview Route this Wednesday, August 15th. The fifth NYC Ferry Route will connect Soundview, Bronx and the Upper East Side of Manhattan to hubs on 34th Street and Pier 11/ Wall St, connecting millions of New Yorkers to new neighborhoods, growing job centers, housing and more. 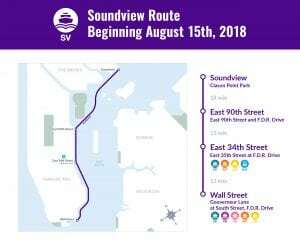 The Soundview Route will run from the Soundview, Bronx (Clason Point Park), to E.90th Street on the Upper East Side, to East 34th Street, ending its run at Wall Street/Pier 11 in under an hour. Riders will be able to travel from the Bronx to Manhattan in under an hour. View our downloadable schedule here for departure and arrival times. To travel with NYC Ferry, there are various tickets options available for purchase. Bikes are welcome on board for a $1 fee. You can purchase tickets from our app which is available to download on your iPhone and Android phone. It is the fastest way to travel with a tap and go option. Tickets are also available for purchase on all NYC Ferry Landings. Unactivated tickets are valid up to 1-year from date of purchase. Children under the height of 44 inches can ride for free when accompanied by an adult. Stroller parking is available onboard. 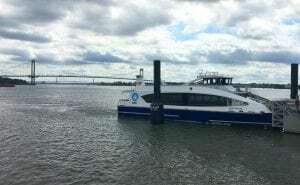 NYC Ferry also offers free transfers between routes. From E 34th St. commuters can transfer, for free, to our Astoria, East River, and Lower East Side Routes. From Wall St./Pier 11 commuters can transfer for free to our Astoria, South Brooklyn, East River, Rockaway and Lower East Side Routes. Clason Point Park is the perfect location for great views and stroll. It’s right by the landing for easy access into the city. E 90th St is all the buzz with restaurants, yoga studios, parks and city views. The Auction House is the best place to visit when looking for downtown when you’re uptown. It is only an 11-minute walk from our new landing at E 90th Street. In the mood for German Cuisine? Take a 15-minute walk from our landing to Heilderberg Resturant. Feeling like Italian instead? 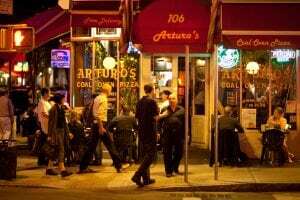 Visit Italiamissiom only a 16-minute walk from our landing or visit Arturo’s which is just a nine-minute walk from our landing. 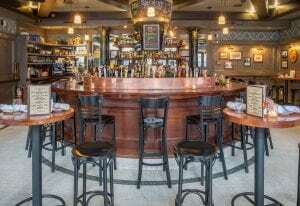 To all the oyster lovers visit Five Mile Stone for $1 oysters all day, and it’s only a 15-minute walk from our landing. Take a ten-minute walk from our landing to try Bareburger or if you’re looking for something even closer visit The Mansion which is only an eight-minute walk from our landing. Looking for an afternoon activity? We recommend taking a walk through Carl Schurz Park, which is steps from our landing. Visit The People’s House, Gracie Mansion, for a tour on Monday’s at 10:00 am, 11:00 am and 5:00 pm. We also recommend relishing in a relaxing Yoga class with New York Yoga, located a brief nine-minute walk from our ferry landing or stop by Asphalt Green for sports activities, summer camps, swimming and more! We welcome you on board to Work. Live. Play. and explore new connections to waterfront communities along the East River. #Cruiseyourcity this weekend along our East River Route for food, music and comedy!